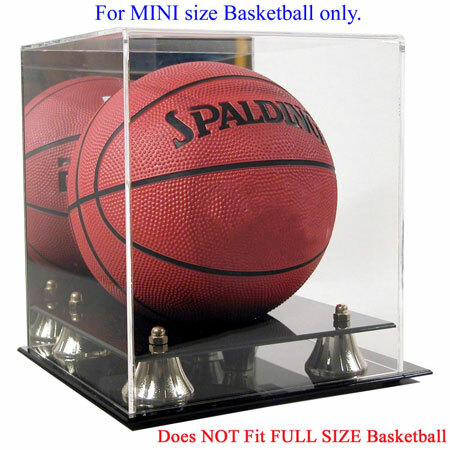 Warning: This display case will NOT hold a Full/Regular size basketball. This is for Mini (half size) basketball only. Each holds one mini sized basketball. Exterior dimensions: 7.5"W x 7.5"D x 8.5"H, Interior dimensions: 7" x 7" x 7" Double layered black acrylic base with gold risers and center cut hole to hold the ball in place Clear acrylic cover with mirror back; rubber feet on the base; Clean Cut on base. No exposed base to catch dust. Interior dimensions: 7" x 7" x 7"